Believed to have been long-since defeated by his rival Jonathan Joestar, Dio Brando returns in part three of Jojo's Bizarre Adventure. As his previously-severed vampire head has attached itself to Jonathan’s body, Dio now shares a strange bond with Joseph Joestar, Joseph’s daughter Holly, and his grandson Jotaro Kujo, through projections of their own willpower called Stands. Dio’s ultimate goal is now to wipe out the remaining members of the Joestar bloodline, and to do so, he will call upon the most corrupt and detestable Stand users he can find. Stands manifest in ways unique to each user, with Jotaro’s Star Platinum capable of delivering many quick and powerful punches with insane precision. Joseph’s Hermit Purple forms a string of thorns that can be used to grapple onto objects within a rather short range, but its primary use is that of projecting images through photographs and television sets to give the heroes an idea of what Dio’s next move will be. As Holly does not acclimate well to her Stand, she falls ill shortly after Joseph comes to visit her and bail Jotaro out of prison. 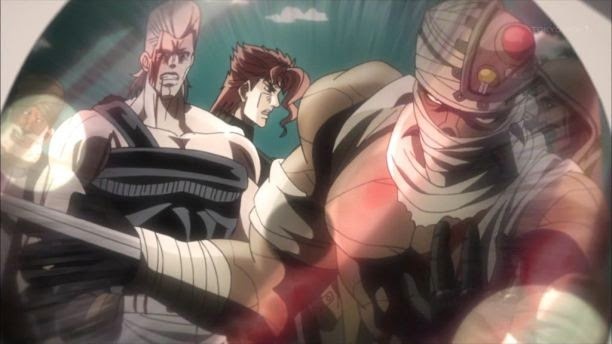 Knowing that Holly likely does not have the strength to overcome her own Stand, which proves to be of a parasitic nature, Joseph and Jotaro decide to travel to Egypt to face the problem at its source – Cairo, Egypt, where Dio is hiding. Even before they leave Egypt, Joseph and Jotaro encounter two allies who vow to help Holly and stamp out Dio and his villainous followers. These are Muhammad Avdol, an Egyptian who commands the flames of Magician’s Red, and Noriaki Kakyoin, a student around the same age as Jotaro, whose Hierophant Green can thin itself out and explore small crevices as well as perform a spread shot attack known as emerald splash. Before long, the four heroes meet Jean Pierre Polnareff, a goofball who, despite his tendency to distract his ultimate aims with constantly chatting up pretty women, has a heart of gold and will not rest until the man who murdered his sister – a man with two right hands – is served justice. With Stardust Crusaders being set in the 1980s, the culture and worldview is distinctly different from that of Battle Tendency, in the same way that arc was so far removed from its own predecessor, Phantom Blood. With mass transportation now available on every continent, the heroes trip gains some significant headway early on, but it is not long before Dio begins ordering his faithful followers to crash the planes and hijack the boats that the gang attempts to use in their traveling nearly halfway around the globe. And while the gang is ever-determined in their aims to stop Dio and save Holly (as well as the rest of the world), the Stand users they encounter begin to learn their weaknesses and their fears in hopes on exploiting these to gain the upper hand and please lord Dio – for the only way to defeat a Stand user is to either best the Stand in combat, or defeat the user in person. With some Stands having incredible range, and others considerable levels of power, the same tactics are not always viable. The comforts of home miles behind them, the gang travels through the ports of Singapore, the crowded streets of India, the narrow mountain roads of Pakistan, and across the Arabian Desert, traveling in beat-up automobiles, on the backs of camels, and whatever other means are available to them in locales that become increasingly further off the grid. Not all of their enemies prove as intelligent as one another, however. 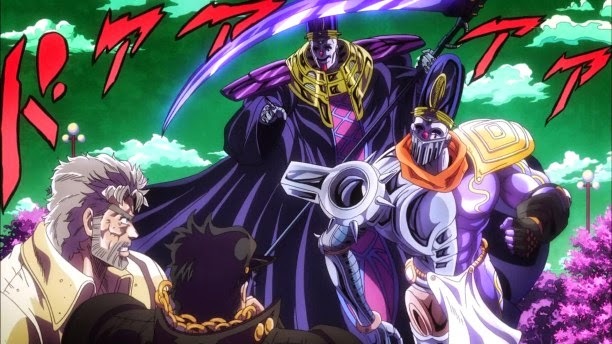 While Steely Dan’s attempt to plant his Stand within Joseph’s Brain and Enya Geil’s ability to control bodies after puncturing holes in them are equally lethal and powerful, many of Dio’s followers – particularly those encountered earlier on in the series – rely too heavily on their Stands and their cockiness proves their undoing. As a result, some of the less impressive and subsequently less exciting Stand users are introduced and dealt with in the same single episode, while fan favorites from the manga typically earn themselves two full episodes in the spotlight. The budget of Stardust Crusaders is notably higher than that of its 2012 predecessor. 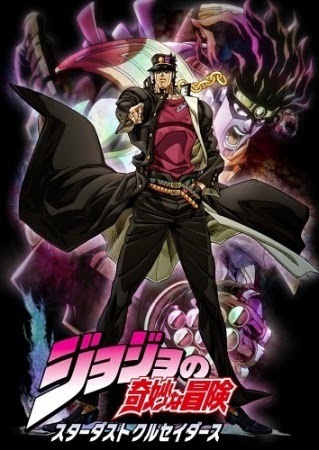 While the animation style takes on a style more akin to the manga, with semi-exaggerated character designs and thicker outlines, the soundtrack is a mix of epic humming battle themes and funky jams that wonderfully compliment the action/comedy hybrid that is the core of Jojo’s Bizarre Adventure. This first season runs twenty-four episodes in length, and while there is still plenty of story to be told by the time all is said and done, this first arc does a masterful job of granting each of the five protagonists time to shine through and develop into quirky, respectable heroes. They each make their missteps, and while it’s true that Jotaro comes across as brash and foul-mouthed at first, the fact that these characteristics simmer as he hones his abilities with Star Platinum shows a great deal of maturity on his part, and an outlook on the larger picture that is quite different from that of his own grandfather, a man who sent the supposed ultimate life form Cars sailing through the stratosphere decades before. Meanwhile, Kakyoin is typically the most reserved of the lot, and alongside Avdol, makes up the more serious side of the group. That said, there are occasions where Kakyoin will make some completely unexpected statement or gesture that falls more in line with Polnareff’s wacky nature, and the fact that these come out of seemingly nowhere makes them all the more humorous. 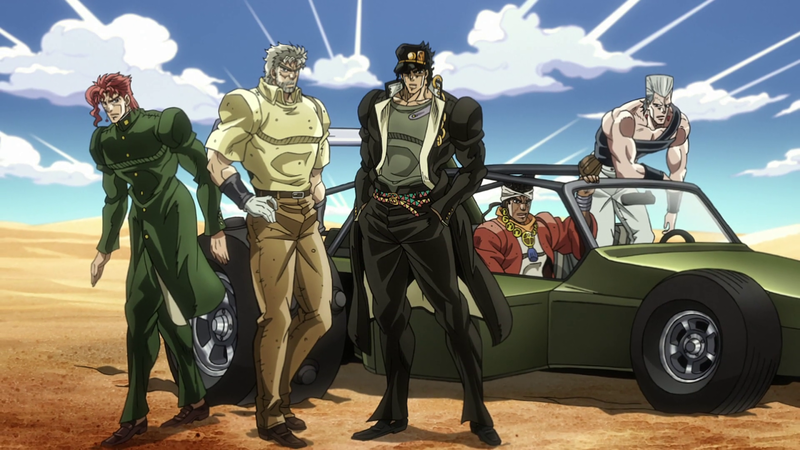 Plenty of struggles lie ahead for these five unlikely heroes as they have yet to face off with the strongest of Dio’s loyal subjects, but make no mistake – for being only the first half of the long-overdue proper anime adaptation of the most popular part of Jojo’s Bizarre Adventure, this first portion of Stardust Crusaders is nigh-on masterful in its execution. Few anime series are this consistently fun from start to finish, and the culmination of all these qualities is a testament to the care and attention the anime staff has put into bringing the pages of the manga to life.